Just because your outdoor space is small does not mean you have to settle for a tiny, closed off look. The following are steps and tricks to make your small lawn look bigger. You can add dimension to small yard using arbors, pergolas, trees, and vertical garden wall features. The Leyland Cyprus grows three to four feet per year, and is often used as a privacy screen feature. These trees do require regular pruning and maintenance because they are susceptible to disease, so only use them if you are ready to put in the time to care for them. Other tall choices include birds of paradise and banana plants. If you have a lackluster fence, you can use it to add dimension to your yard by covering it with a vertical garden. Tall bamboo makes a great cover for fencing, and if your neighborhood permits it, you can allow it to grow even taller than the fence. Grass can still be part of a small yard space, but it is better to mix it with other materials instead of covering the entire space with sod. The easiest way to add grass to your smaller yard is to order sod directly from us or your local sod farm if you live outside of Arizona. Plants with small leaves reflect light and that causes them to seem like they are more distant, and they blend into the background. 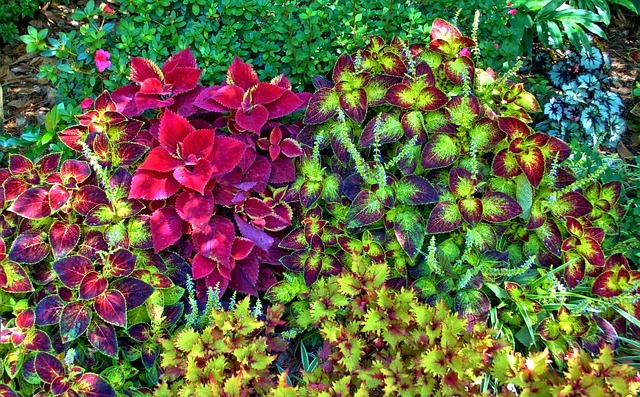 You should use these types of plants around the edges of your yard away from the entrances. Plants with big leaves, such as philodendrons, will make a small space feel larger when they are used around entrances and focal points. Big leaves provide more visual interest and the shadows they cast give the illusion of depth. Just like plants with big leaves focus the eye's attention to entryways and focal points and cause the rest of the space to draw back visually, color can have the same effect. Colors like yellow, red, and orange stimulate the brain and are a great choice for places you want people to focus on. Cooler colors like blue and pink are not as stimulating and should be used near boarders and in the outer edges of the yard. Using warm colors near your house will also draw attention to it instead of towards the yard. Red bricks will do the trick, or you can use flowers. Just make sure that there is always something blooming in your color choice. Art with straight or modern lines will help make your yard look bigger. You can also use a fountain, statue, or spiral topiary. Using a bright art piece on a distant wall will draw the attention into the distance. Following these tips will help you make the most of your smaller outdoor space. You can follow one or two, or all of them depending on how ornate you want your landscaping to be. The choice is yours.